San Marco has had multiple building phases and its rise to becoming a palatine chapel mirrored the rise of the Venetian state itself. There have been three different phases of building at San Marco. The predecessor to San Marco was a church dedicated to St. Theodore as early as 819 or before. According to inscriptions found, this original chapel was decorated in paintings and mosaics. There is no visual reconstruction of this building available. However, Otto Demus speculates that because the patron saint at the time was a Greek warrior associated with battles in the near east the chapel may have had a domed roof in the Byzantine style or architecture influenced by Greek architects. The first church of San Marco was begun in 829, which is around the same time the relics would have appeared in Venice. 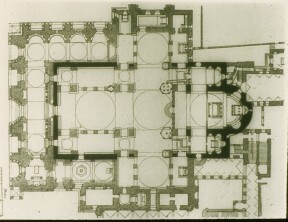 There is a strong possibility that some of the first structure was used in the building of the later phase of San Marco. There is no clear reconstruction of the plan; the first phase may have been based on a basilica style church or a cruciform church. What is most strongly believed is that it may have been similar in style to the Holy Apostles Church in Constantinople. 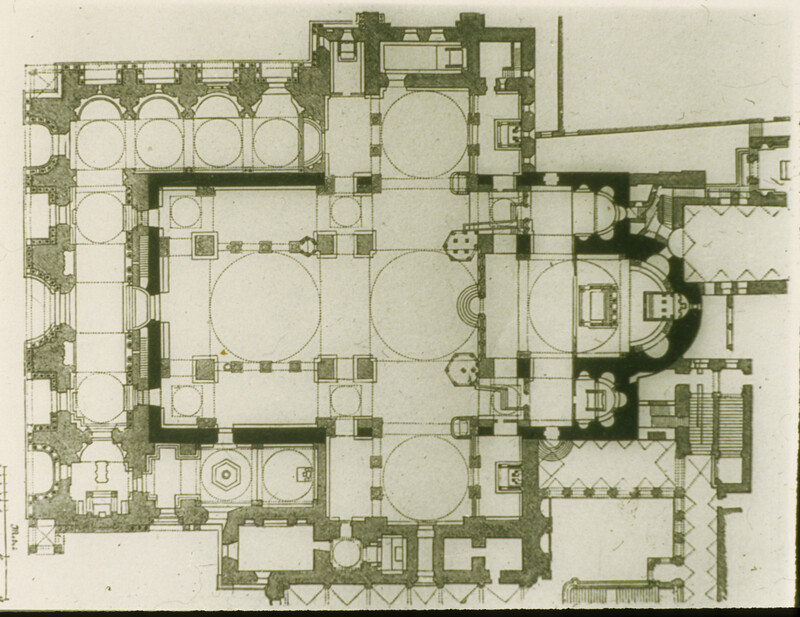 Plan of San Marco, 13th Century, (Image provided by UMW Slide Library). After Venice acquired St. Mark’s remains they changed the focus of the design of the building from that of the Holy Sepulcher in Jerusalem to the Apostoleion in Constantinople where the last Roman Emperor Constantine’s dynasty was interred beside the bodies of the Apostles. This first version of San Marco was destroyed in 976 by a fire and a second eventually rebuilt in 1063 (fig. 1). The interior decoration including the mosaics was likely finished by 1094. Otto Demus, The Church of San Marco in Venice, 4. Demus, The Church of San Marco in Venice, 63. Demus, The Church of San Marco in Venice, 64. Demus, The Church of San Marco in Venice, 67. Fabio Barry, “Disiecta membra: Ranieri Zeno, the Imitation of Constantinople, the Spolia style, and justice at San Marco”, 7. Edgar Waterman Anthony, A History of Mosaics. (New York: Hacker Art Books, 1968), 191. ©2011 2011 Venice Exhibit. All rights reserved. Proudly powered by UMW Blogs.